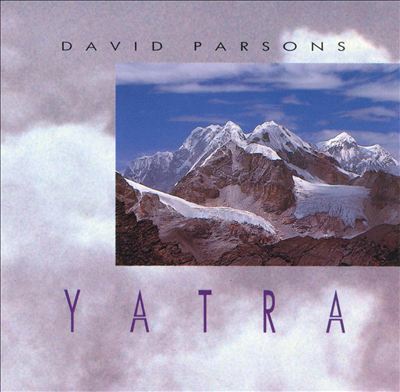 Parsons music shows a profound affinity with Indian and Tibetan cultures, an understanding which reaches into the furthest recesses of Eastern religious experience and the landscapes in which it evolved...his art remains one of the purest, most potent distillations of the East through a Westerner’s eyes that’s ever been committed to music. Like his fellow electronic ambient composer on the Celestial Harmonies label Jon Mark, David Parsons possesses an extraordinary gift for capturing a sense of place. But while Jon Mark’s reference points have moved from Celtic Britain to Spain to the Middle East and beyond, Parsons’ well of inspiration has remained mostly on the Indian subcontinent and South East Asia for his entire career. So what makes his music so special? It's true that musicians in the ambient and new age genres have long toyed with ethno-ambient fusions. And Parsons choice of instruments is no different than that used by many a new age boffin; synthesisers, voice samples and samples of traditional instruments. But the similarities end there. Parsons music shows a profound affinity with Indian and Tibetan cultures, an understanding which reaches into the furthest recesses of Eastern religious experience and the landscapes in which it evolved. Parsons is the real thing. Not in an anthropological sense, of course, and he would certainly never claim to be. But his art remains one of the purest, most potent distillations of the East through a Westerner’s eyes that’s ever been committed to music. Parsons first two albums Sounds Of The Mothership (1980) and Tibetan Plateau (1982) were originally released on American indie label Fortuna where they found a receptive audience among new age listeners. The first is non-essential, but Tibetan Plateau is a must for fans and remains of one the greatest meditative albums from the early days of indie and self-published new age music. It took a while for word to spread, but some years later Eckart Rhan from American label Celestial Harmonies was sufficiently impressed with Parson's talents to keep him on board after Celestial bought Fortuna. Parsons has been with Celestial ever since and has arguably been the label's most successful latter-day artist. Himalaya (1989) marks the beginning of Parsons’ mature work. Alongside the later Yatra (1990) and Dorje Ling (1992) it shows a composer already at the dizzying peak of his powers: refined, focused and extraordinarily sensitive to his surroundings. It is music, said U.S. broadcaster John Diliberto, "informed by an Eastern sense of time, the idea that music is always becoming rather than arriving". It’s deep. Really deep. From the opening organ strains of Himalaya’s twenty-minute title track, Parsons slowly draws you into a sonic world where spiritual is simply too inadequate a word to convey such an exquisite sense of awe and reverence. With sustained organ chords, wafting synth melodies and subtle voicings Himalaya offers beautifully shifting textures, enhanced by occasional cymbals, tabla drums and the distinctive drone of the Indian tamboura. The double album Yatra remains his most ambitious work, full of poignant musical impressions of his journeys through India and Tibet. Parsons’ most developed rhythmic pieces are found here. The title track cleverly plays off a looped drum pattern against samples of street hawkers selling their wares, while “Bengal Village” and “Assi” use bright, electro-acoustic arrangements of Indian folk melodies. But his fondness for extended deep space excursions remains, and the swirling epics “Maha Puja” and the “Manasarovar” are mesmerising, ever so subtly drawing on samples of ritual chanting as the trance-like tones slowly unfold. The digitally sampled sounds on Yatra - especially the drum loops - date from the early 90's and are now showing their age somewhat, with sampling technology having improved enormously since. Listeners who can get over this minor hurdle, however, will find the album's power remains undiminished. Dorje Ling from 1992 is also masterful, blessed with the same subtle grandeur as Yatra and exuding a deeply reverent atmosphere. The Tibetan angle is more overt here, most pronounced on the twenty-minute title track. It opens with a sustained bass drone, the crystalline sound of Tibetan bells and other traditional percussion. You get the feeling that you’re the invisible participant in some kind of traditional ceremony. And when the vocals of Buddhist monk Tenpin Wangdu first rise above the surface, only the harshest cynic would not to be moved. If you’ve already heard the other-worldly buzz of harmonic throat singing, you’ll know what to expect. Following the release of Dorje Ling the 1990's turned out to be a fairly inactive decade for Parsons in terms of releasing his own material. Instead he spent much of this period traveling the world collecting field recordings for Celestial Harmonies' much-acclaimed Music Of Islam series. Towards the end of the 90's, however, he returned to composing and what turned out to be his most prolific period, releasing more than a dozen albums up to 2013. Not all of them are classics by an means, but some are among of his finest. The stunning Maitreya: The Future Buddha (2002) finds him somehow reaching even deeper into the recesses of Tibetan Buddhism than he did on Dorje Ling. The result is an extraordinary and richly textured musical meditation spread over seven varied tracks. Parson's trippy sound design has never sounded so assured: the breathing, widescreen synthetic drones and dark-edged Eastern melodies are meshed with shimmering percussion, moments of discordant sound and layers of chanting. It's a heady mix as authentically psychedelic as any 70's Berlin-school ambient or deep chillour music from the psytrance scene. Inner Places (2005) is the first Parsons album without any percussion - there's no tabla, no crashing Tibetan cymbals - and it's probably the quietest work he's ever released. Although dark and semi-abstract at times, it's made with a sure hand of a master and is a hypnotic experience. Dating from 2008, 2009 and 2010 is a trilogy of albums which mark a fundamental shift in Parson's approach to producing sounds. Here he has abandoned sampling and playing of acoustic instruments altogether and everything is generated with his synths, oscillators and filters. Parsons aim, he writes, is to achieve a "surrealism unachievable with straight sampling or sound effects." On two of these albums - Earthlight (2008) and Jyoti (2009) - he achieves that goal admirably. The melody that emerges on "Bathing Light", for example, sounds somewhat like a sitar but isn't. The melodic bell-like pulses on the ravishing "Jyoti" sound a more sc-fi than Tibetan. Much of the time there is no attempt at reproducing acoustic sounds; it's all about pure synthesis. Yet Parsons' absorption of Eastern and other sacred musical traditions over such a long period - particular drones - has ensured that the meditative, panoramic qualities of his music remain intact and his sound palette is no less rich. In fact there are many new sounds, particularly on Joyoti. Drone pieces like "The Valley Below" are striking and vivid, sounding quite unlike anything he's done before and echoing some of Japanese composer Tetsu Inoue's environmental ambience. Parsons best recordings are classics of old-school ambient and remain among the most precious jewels in the enormous Celestial Harmonies catalogue. German composer Eberhard Schoener once wrote that, as Westerners, our psyche has evolved in ways totally different to the East, implying that we can be little more than awe-struck observers of its cultural experience. If this is true - and I suspect that it is - Parsons is indeed fortunate, for he has secured himself the most privileged of vantage points. We can be thankful he has returned to share it with us.